(April 5-7, 12, 13 & 15th at SCDT 25 Main Street, Northampton, MA. 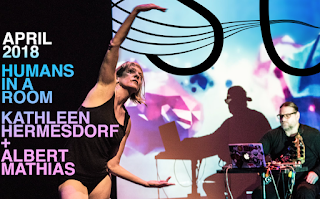 Kathleen Hermesdorf is an international dance artist, educator and producer based in San Francisco. She directs ALTERNATIVA, with musician Albert Mathias. 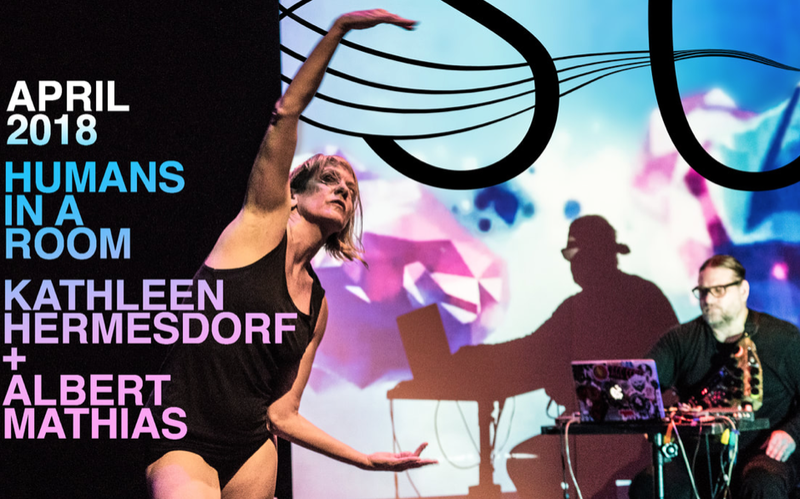 Hermesdorf has been dancing in the Bay Area since 1991 and teaches, performs, improvises, creates and curates around the world. Her work has been presented in the Bay Area, New York, Seattle, Berlin, Amsterdam, and Dakar, amongst other locations, in commission for universities, companies and independent dancers, and in collaboration with art partners worldwide. She was a member of Bebe Miller Company, Contraband/Sara Shelton Mann and Margaret Jenkins Dance Company, and co-director of Hermesdorf & Wells Dance Company with Scott Wells and Collusion with Stephanie Maher, a partner in PORCH summer/school at Ponderosa in Germany since 2010. Hermesdorf brings over 20 years of experience from the field, studio and stage to her work and holds a BFA and an MFA in Dance Performance + Pedagogy. Albert Mathias is a multi-disciplinary musician based in San Francisco since 1991. He creates and performs composition and sound design for dance, theater, film, video and audio mediums, and is the music director of ALTERNATIVA, with director/dancer Kathleen Hermesdorf. He was a member of Bebe Miller Company and Contraband/Sara Shelton Mann, and has created original sound scores for myriad dance companies. In 2000, he was nominated for an IZZIE Award with ALTERNATIVA and received a BESSIE Award in 2006 with Bebe Miller Company. Mathias has produced 15 records of original music and collaborated in numerous bands, most notably LiveHuman, an internationally acclaimed improvisation-based trio with DJ Quest and bassist Andrew Kushin. Mathias attended California Institute of the Arts, training in tabla, voice and accompaniment, and has had the honor of private study with Pandit Swapan Chauduri, Sri Ravi Bellare and Tony Williams. His eclectic sounds can be found on I-Tunes, Bandcamp and CD Baby. A workshop investigating the corporeality, humanity and artistry of being a body through dance, somatic modalities, energetic systems, improvisational practices, physical experiments and scores, both devised and open. Working with atmospheric, visceral and rocking live music, we'll explore the body from perspectives of instinct, impulse and intuition, as well as human nature, human behavior and group dynamics, while experiencing the simplicity and complexity of moving and listening with attention, intention and imagination. GUT Motives is an alternative contemporary dance class and ongoing research by ALTERNATIVA investigating corporeality and the act of motion from internal impulse to external expression. The work utilizes a hybrid of forms to encourage deep awareness and understanding of the body and the body in motion. The practice is a progression of energy cultivation, hands-on investigation, somatic improvisation, technical experiments and methods of falling, flying and inversion, culminating in dynamic, dimensional phrase work. The class is an intimate, animated arena for physical and artistic exploration, deeply informed by live, original music, and cultivating sensate virtuosity, kinetic efficiency, physical perception, interactive intelligence and performance-level dancing. Help Forbes Library build a new web archive! Young@Heart Chorus "Welcome to Your Life"